Playland provides catered lunches for campers and counselors five days a week. Please see the 2019 menu below. 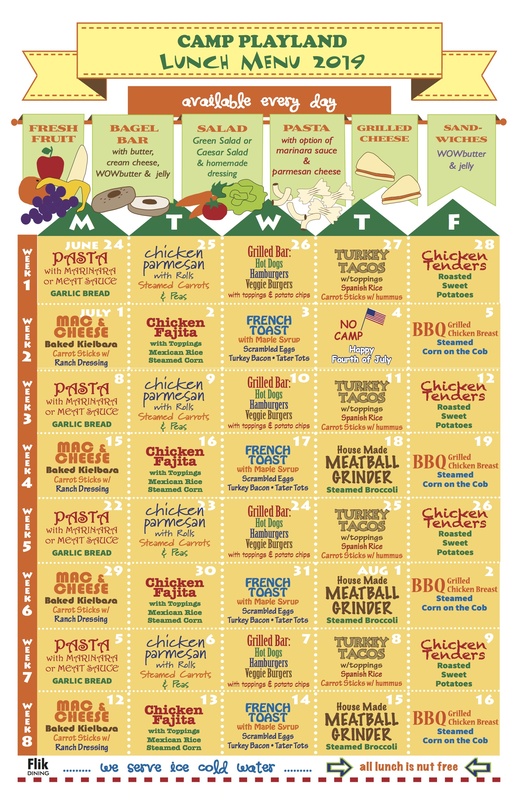 We are committed to serving healthy and appropriate lunches to all campers. We respect the dietary needs of all children. Head Counselors help serve lunch for their groups and they will accommodate the “picky eater” with foods they will enjoy. Please contact the camp office with any food related concerns. No child will go hungry at Playland. Camp provides an afternoon snack for all campers. Afternoon snack consists of a popsicle or ice cream, watermelon, apples, bananas and oranges and pretzels. CAMP PLAYLAND IS A “PEANUT / NUT SENSITIVE” ENVIRONMENT – There are children throughout the camp with peanut and nut allergies. Campers and counselors should not bring peanut butter or other peanut / nut products to camp. For everyone’s safety and because peanut / nut products are found in so many food items, campers will not be allowed to share food. All food that we provide will be peanut and nut free.